Puff pastry and chocolate chips make these chocolaty turnovers a snap to prepare. Combine 1 1/2 cups chocolate chips and cinnamon in small bowl; set aside. Unfold one pastry sheet; roll on lightly floured surface to form 12-inch square. Cut into nine 4-inch squares. Place 1 heaping tablespoon chip mixture onto center of each square. Lightly brush egg mixture onto edges of each square. Fold diagonally in half; seal edges. Transfer to ungreased baking sheet. Repeat procedure with remaining puff pastry sheet and remaining chip mixture. Lightly brush tops of turnovers with egg mixture. Bake 15 minutes or until light golden brown. Remove from baking sheet to wire rack. Place remaining 1/2 cup chips and shortening in small microwave-safe bowl. Microwave at HIGH (100%) 1 minute; stir. If necessary, microwave at HIGH an additional 15 seconds at a time, stirring after each heating, just until chips are melted when stirred. 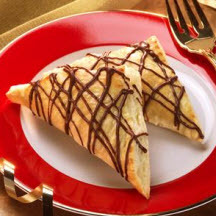 Drizzle melted chocolate over each turnover. Cinnamon Turnovers: Omit chocolate chips and ground cinnamon. Use 1 2/3 cups (10-ounce package) HERSHEY’S Cinnamon Chips. Reserve 1/3 cup cinnamon chips for drizzle; use 1 1/3 cups chips for filling turnovers. Follow directions given for Chocolate Turnovers.